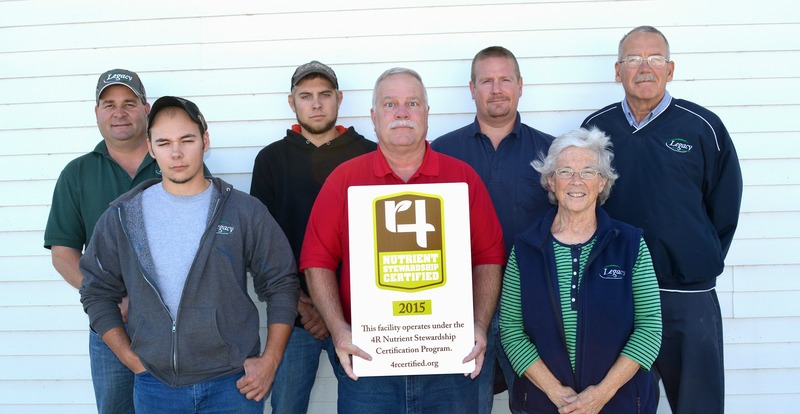 The 4R Nutrient Stewardship Certification Program has announced that Legacy Farmers Cooperative’s facilities in Arcadia, Arlington, McComb and Pandora, Ohio have all been added to its growing list of nutrient service providers to achieve certified status. With this announcement, all five of Legacy’s agronomy locations have now achieved 4R Nutrient Stewardship Certification. The company’s Custar, Ohio facility achieved certified status in October 2014. Legacy Farmers Cooperative provides a wide variety of services across nine counties. The company’s 11 grain facilities market and handle grain, in addition to its five agronomy locations. Legacy Farmers Cooperative also serves its lawn & pet, turf and petroleum customers, including operations of two self-service, 24-hour fuel stations. The four newly-certified Legacy facilities feature 50 full-time employees, including eight certified crop advisers, serving approximately 550 grower customers, affecting 250,000 acres in the Auglaize, Blanchard, Cedar-Portage, Lower Maumee and Ottawa Western Lake Erie Basin watersheds. Over 300,000 acres and 650 customers are serviced by Legacy’s agronomy facilities. More than 1.4 million acres and approximately 3,700 farm clients are serviced by the 21 facilities in Ohio and Michigan that have earned 4R Nutrient Stewardship Certification, with approximately 60 percent of those acres being in the Western Lake Erie Basin. “The Nutrient Stewardship Council congratulates Legacy Farmers Cooperative on its commitment to the program, having earned certification for all of its agronomy facilities,” said Andrew Allman, executive director of the Nutrient Stewardship Council. “Legacy Farmers’ agronomy facilities have proven their dedication to the long-term improvement of Lake Erie’s water quality by following the 4Rs,” said Carrie-Vollmer Sanders, Nutrient Stewardship Council chairwoman. The 4R Nutrient Stewardship Certification Program is governed and guided by the Nutrient Stewardship Council, a diverse set of stakeholders from business, government, university and non-governmental sectors with a common goal of maintaining agricultural productivity while also improving the quality of Lake Erie and its contributing watersheds. The program is administered by the Ohio AgriBusiness Association. For more information, visit 4Rcertified.org, email aallman@oaba.net or call 614-326-7520. MEDIA: High-resolution photos of Legacy’s facilities receiving their 4R Nutrient Stewardship Certification signs are available below. Click the name of the photo with the associated cutline to download a high-resolution version. Legacy Arcadia: Legacy Farmers’ agronomy location in Arcadia, Ohio is now 4R Nutrient Stewardship Certified. Employees pictured include (from L to R), Back Row: Kenny Allshouse, Max Zyski, Joel Ryder, Ryan Mangas, Dave Hill and Logan Eaton. Front Row: Karla Beagle, Ridge Lewis, Whitey Roller, Steve Lantz and Jim Boger. Legacy Arlington: Legacy Farmers’ agronomy location in Arlington, Ohio is now 4R Nutrient Stewardship Certified. Employees pictured include (from L to R), Back Row: Andrew Solt, Brett Parish, Dan Schaller and John Bormuth. Front Row: Mitchell Haugh, Joe Spaeth and Terri Metzger. Legacy McComb: Legacy Farmers’ agronomy location in McComb, Ohio is now 4R Nutrient Stewardship Certified. Employees pictured include (from L to R), Back Row: Tony Brown, Neal Boes, Rick Bowyer and David Metzger. Front Row: Andy Heacock and Mike Graham. Legacy Pandora: Legacy Farmers’ agronomy location in Pandora, Ohio is now 4R Nutrient Stewardship Certified. Employees pictured include (from L to R), Back Row: Scott Wischmeyer, Mark Kingen, Dave Koch, Jim Ricker and Duane Ricker. Front Row: Josh Leffler, Bob McDowell, Courtney Gerten and Eric Siefker.